The EVN Flameless Vent is ideal for dust explosion venting inside production buildings. 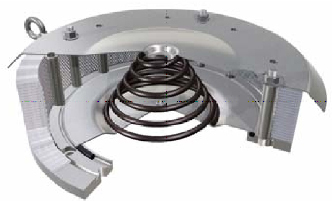 The EVN Vent comprises a spring loaded valve plate, valve seat and flame quenching filter element. During an explosion, the pressure wave acts upon the valve plate causing it to open. This allows the flame to enter the quenching chamber. Here, pressure is allowed to dissipate through the flame quenching filter but the flame itself cannot pass. Once the explosion has extinguished, the valve plate returns to its operating position. After an explosion the EVN Vent can be re-used. The unit does not necessarily need to be returned to the manufacturer. Savings are made in spares holding and down-time as a result. The result is a cost effective solution for plant designers and end users for all industries.